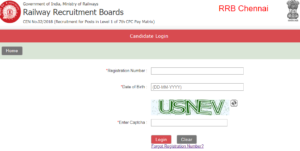 chennai.rrbonlinereg.in Hall Ticket Download 2018 Admit Card, Login – Railway Recruitment Board organises RRB Examinations on the continuous basis. In these huge recruitment drives of Railway Recruitment Boards, Government of India, Ministry of Railways, not hundreds, not thousands, not lakhs but crores of candidates filled in the Application Form in every next recruitment drive. RRB Chennai is going to organise the test for CEN number 02/2018 (recruitment for posts in Level 1 of 7th CPC pay matrix) in October, November and December. Precisely, 3rd Batch of the examination will be held from 29th October 2018 to 17th December 2018. For those candidates who have forgotten their registration number, can obtain it back by entering the date of birth, along with this, anyone option to go throughout of Email ID, Aadhar Number and Mobile Number need to be entered. This test of RRB will be organised in total four major stages that is – Computer Based Test (CBT), Physical Efficiency Test (PET), Medical Test and Document Verification (DV). In this upcoming computer-based test (objective) total 25 marks, 20 marks, 30 marks and 25 marks questions will be asked from General Mathematics, Arithmetic’s Ability, General Intelligence and General Science Paper of 90 minutes. 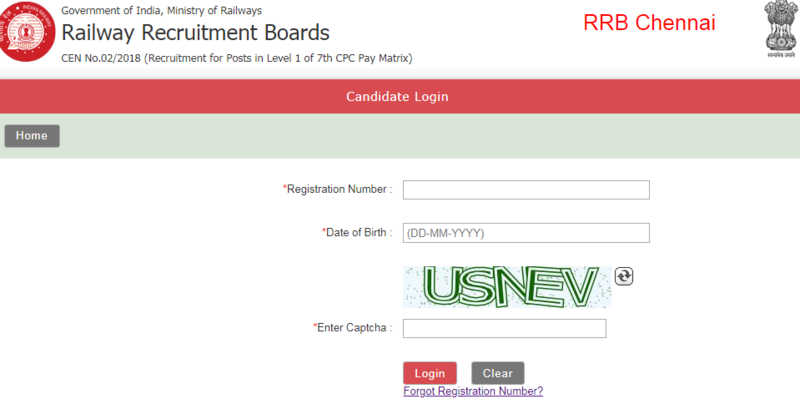 Important link for chennai.rrbonlinereg.in Hall Ticket Download 2018 Admit Card, Login is given below.